^ 〈本世紀內兩次十月革命〉. 麥上行《有彈有讚》 (《快報》). 1993-10-09. ^ Richard Pipes. The Russian Revolution. Knopf Doubleday. 1990: 407. ^ Michael C. Hickey. Competing Voices from the Russian Revolution: Fighting Words: Fighting Words. ABC-CLIO. 2010: 559. ^ Beckett, 2007. p. 526. ^ Service, 2005. p. 54. 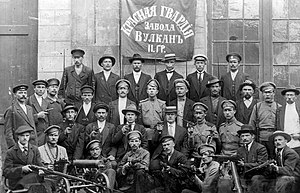 ^ 1917 - La Revolution Russe. Arte TV. 16 September 2007 [25 January 2016]. （原始内容存档于2016年2月1日）. ^ 13.0 13.1 Beckett, p. 528. ^ Jonathan Schell, 2003. 'The Mass Minority in Action: France and Russia'. In The Unconquerable World. London: Penguin, pp. 167–185. ^ Acton, Critical Companion, 5-7. ^ Stephen Kotkin, “1991 and the Russian Revolution: Sources, Conceptual Categories, Analytical Frameworks,” The Journal of Modern History 70 (October 1998): 392. ^ 24.0 24.1 24.2 Acton, Critical Companion, 7. ^ Alter Litvin, Writing History in Twentieth-Century Russia, (New York: Palgrave, 2001), 49-50. ^ Stephen E. Hanson. Time and Revolution: Marxism and the Design of Soviet Institutions. 北卡罗来纳大学出版社. 1997: 130. ^ Kotkin, “1991 and the Russian Revolution,” 385-86. ^ Litvin, Writing History, 47-48. ^ Kotkin, “1991 and the Russian Revolution,” 385. ^ Kevin Murphy, “Can we write the history of the Russian Revolution?,” http://www.isreview.org/issues/57/feat-russianrev.shtml (May 2011). Acton, Edward. Critical Companion to the Russian Revolution. 1997. Ascher, Abraham. The Russian Revolution: A Beginner's Guide. Oneworld Publications. 2014. Beckett, Ian F. W. The Great war 2. Longman. 2007. ISBN 1-4058-1252-4. Bunyan, James; Fisher, Harold Henry. The Bolshevik Revolution, 1917-1918: Documents and Materials. Palo Alto: Stanford University Press. 1934. OCLC 253483096. Chamberlin, William Henry. The Russian Revolution. I: 1917-1918: From the Overthrow of the Tsar to the Assumption of Power by the Bolsheviks. Old Classic. 1935. Figes, Orlando. A People's Tragedy: The Russian Revolution: 1891-1924. Pimlico. 1996. Guerman, Mikhail. Art of the October Revolution. 1979. Kollontai, Alexandra. The Years of Revolution. The Autobiography of a Sexually Emancipated Communist Woman. New York: Herder and Herder. 1971. OCLC 577690073. Krupskaya, Nadezhda. The October Days. Reminiscences of Lenin. Moscow: Foreign Languages Publishing House. 1930. OCLC 847091253. Luxemburg, Rosa. The Russian Revolution. Bertram Wolfe译. New York City: Workers Age. 1940 . OCLC 579589928. Mandel, David. The Petrograd Workers and the Soviet seizure of power. London: MacMillan. 1984. Pipes, Richard. Three "whys" of the Russian Revolution. Vintage Books. 1997. ISBN 978-0-679-77646-8. Radek, Karl. The Paths of the Russian Revolution. (编) Bukharin, Nikolai; Richardson, Al. In Defence of the Russian Revolution: A Selection of Bolshevik Writings, 1917–1923. London: Porcupine Press. 1995: 35–75 [First published 1922 as "Wege der Russischen Revolution"]. ISBN 1899438017. OCLC 33294798. Read, Christopher. From Tsars to Soviets. 1996. Serge, Victor. Year One of the Russian Revolution. London: Penguin Press. 1972 . OCLC 15612072. Service, Robert. A history of twentieth-century Russia. Cambridge, Massachusetts: Harvard University Press. 1998. ISBN 0-674-40347-9. Swain, Geoffrey. Trotsky and the Russian Revolution. Routledge. 2014. Trotsky, Leon. XXVI: FROM JULY TO OCTOBER. My Life. London: Thornton Butterworth. 1930. OCLC 181719733. Trotsky, Leon. The History of the Russian Revolution III. 由Max Eastman翻译 . London: Gollancz. 1932. OCLC 605191028.